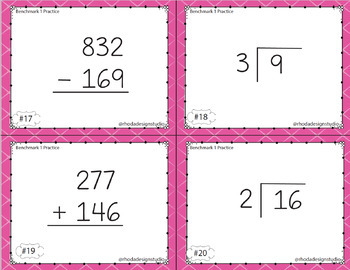 Great for math fluency! 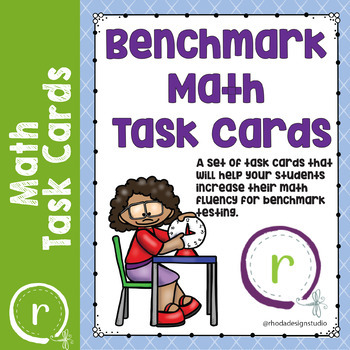 These math task cards can be used as review, independent centers, or to assess skills that your students need to master to succeed during benchmark testing. 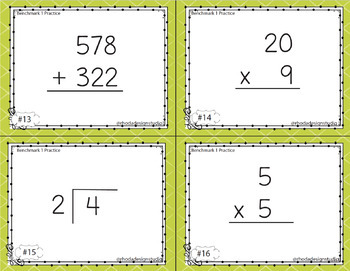 Even if your school doesn't use DIBELS testing, these task cards make great enrichment and introduction of concepts for 2nd grade, review, practice and interventions for 3rd grade or remedial practice for 4th grade. 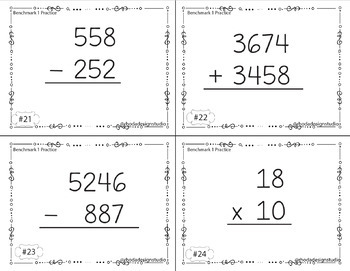 36 quarter sheet task cards (4 tasks per sheet). Color and Black Line! Want to earn free products on TPT and make a teacher-author’s day? Feedback means a lot to sellers on TPT - we want to hear how useful our products are in your classroom and what needs we can fulfill. Don't forget to leave feedback on items you've purchased - you earn 1 TPT credit for every dollar spent on TPT. These credits can be used to purchase future items. Log in, go to "My Purchases" and click on the "Provide Feedback" link next to each product - it's that easy!